Learn Sev Stuffed Paratha Recipe | How To Make Bhujia Paratha (सेव पराठा) recipe with quick and easy step by step video tutorial. 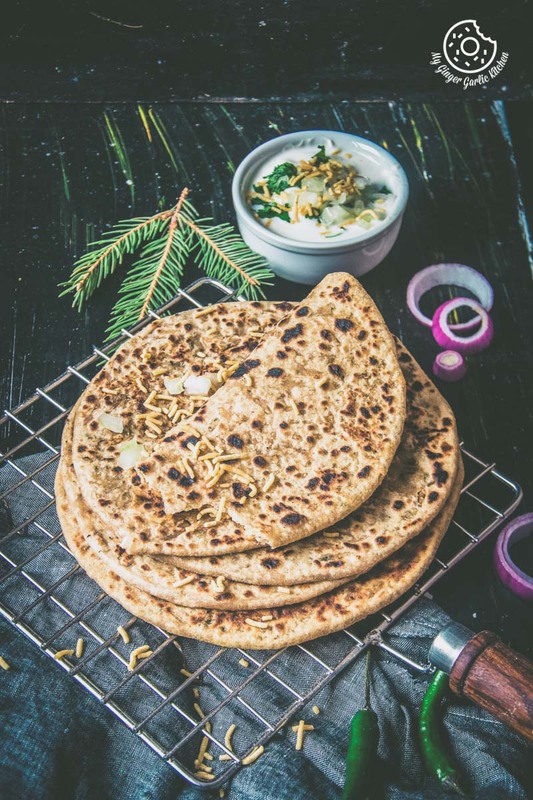 Sev paratha is a simple flatbread stuffed with Sev spiced filling. This spicy and tangy paratha makes one of the most gratifying and delicious breakfasts. I do love a warm bowl of freshly made porridge for breakfast in the mornings, but I also love those parathas which I grew up eating. I have written about my fondness for parathas before, here and here. 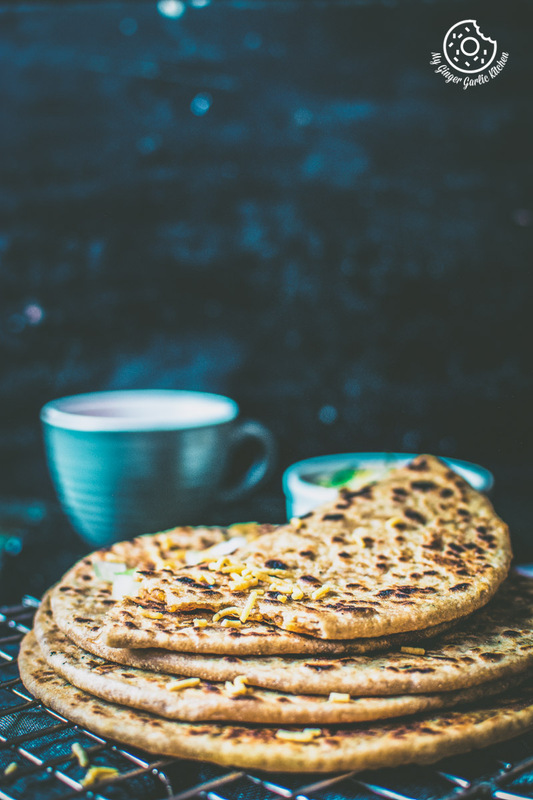 Definitely, you will find that parathas are my ultimate comfort food when it comes to breakfast. And why not, they are a complete meal in itself, you really don’t need any sides with the stuffed parathas. Simply have them with some spiced yogurt, chutney, or pickle and you will be all charged up. I got first introduced to Sev stuffed paratha when I was a child. I must have been about 8 years old. This was the time when my aunt (Masi) made this paratha for breakfast at my grandparent’s home during my summer vacations. I still have a clear vision of that day when I was playing with my cousins. When I was playing, my Mom called me while she was working in the kitchen. I went to her. Then she said, “Today your Masi made something fantastic which I am sure you would definitely admire”. Mom: How about you have it first and then you might be able to guess it well. I know you that you would greatly love this. My Mom passed me off that plate with a hot paratha and some chilled minty yogurt. I ate that paratha and it was a bit unusual but fantastic. I can tell you that I was a complete Sev / Namkeen fan, and I still am. I can even make meals outta Sev, some ketchup and bread slices. I have been very fond of ratlami sev / namkeen aka crunchy and spicy noodles made from chickpea flour/gram flour (Besan). All those tangy and spicy street flavors in hot crispy parathas must have pretty brown spots. 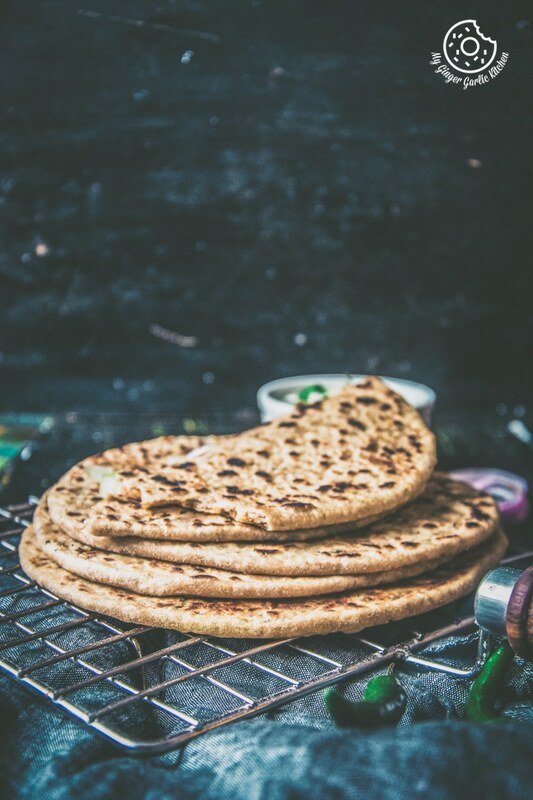 These brown spots are symbols that the paratha has been grilled to a charred perfection. For an added beauty, some onions and coriander leaves should peek out of that luscious paratha. I had these parathas for more number of times than I can count. While my aunty and mom’s version only had sev in it, I also added bhujiya for that awesome taste and texture. You can either use Sev or Bhujiya. Your choice. 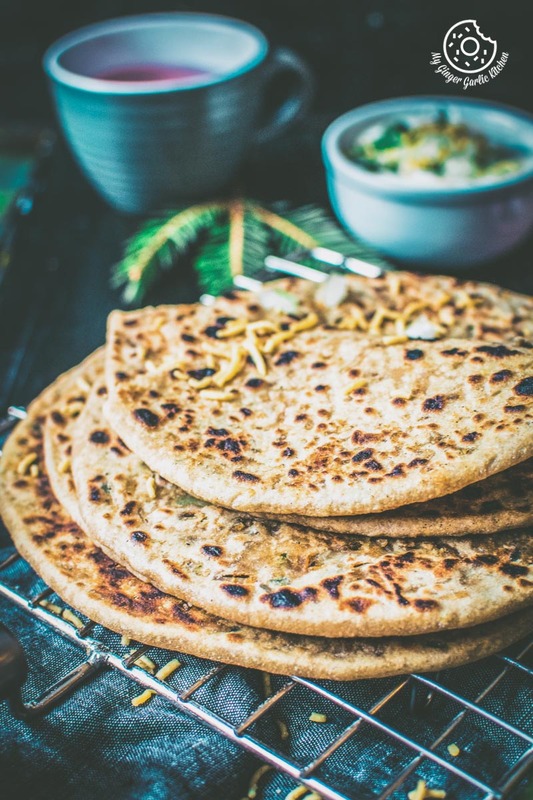 In these parathas, the stuffing of two types of namkeen, onion, green chilies, and spices really is the replica of Indian street food flavours and they go so well together. 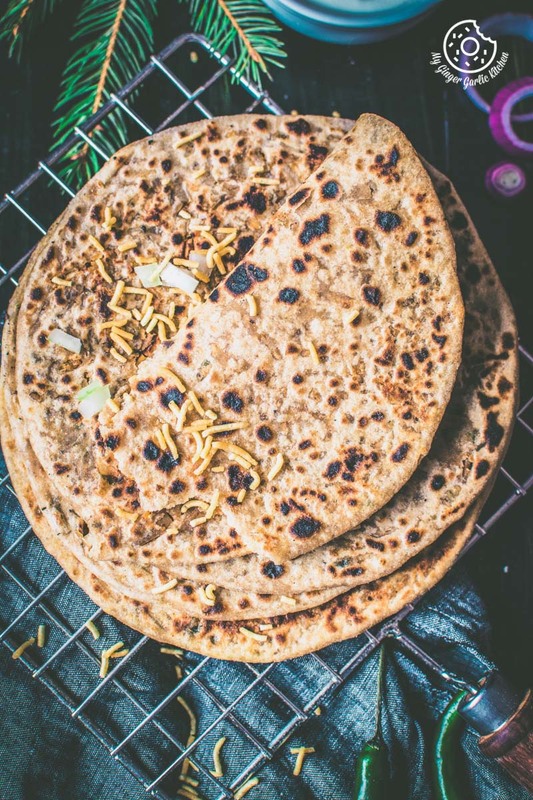 These stuffed parathas themselves are super easy to make, like all the other parathas. Making stuffing for this sev paratha is a cakewalk. 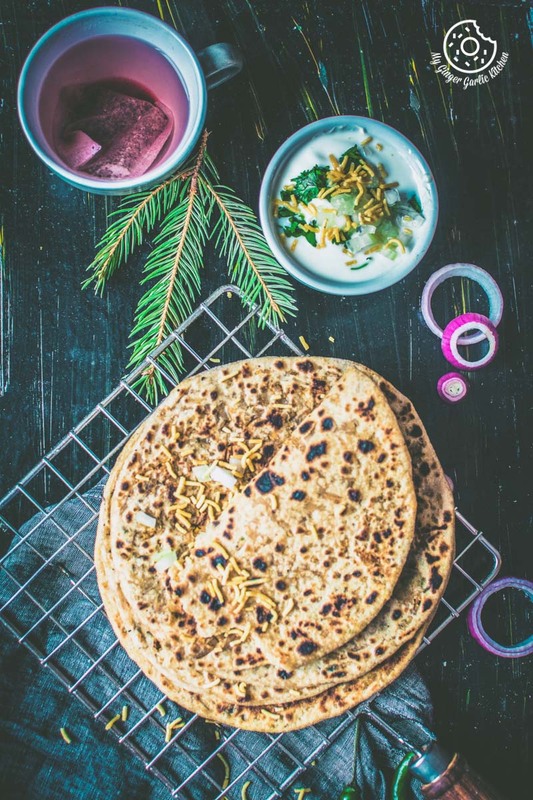 These parathas go well with this raita, green chutney, or tamarind chutney. Any of these add-ons can take this sev stuffed paratha to newer heights. I absolutely love the fact that a straightforward recipe like this paratha, has the power to be a complete meal. Besides, this is trouble-free to make. You can make this Sev Paratha either with ratlami Sev, Bhujiya or any of your favorite sev. I usually make these sev jammed parathas with the combination of sev and bhujia, and then I dress it up with some spices, onions, chillies, and coriander leaves. I used crunchy sev, but you can also make these parathas with your leftover not-so-crispy sev. I love it and so does my family. If you make it and love it, please do share your thoughts in the comments section below. 1. In a mixing bowl, add onions, coriander leaves, green chilies, dried mango powder, salt, red chili powder, roasted cumin powder, sev, bhujiya and mix thoroughly to combine. 1. Add wheat flour, oil, salt and mix well. Now, add enough water to make a soft dough. 2. Knead well to make a smooth dough. 3. Apply a little oil to the dough and cover with a muslin cloth and set aside for 30 minutes. 4. Divide the dough into 8 equal sized balls and keep aside. 2. Place 2-3 tbsp mixture in the center of the dough circle. 7. Apply a little ghee/oil/butter on both sides. 8. Roast until golden brown from both sides. 9. Repeat with the remaining dough and filling to make more parathas. 10. Serve hot with your favorite chutney, pickle and raita. 1. Always make the stuffing fresh, it tends to get soggy fast. 2. I used crunchy sev, but you can also make these parathas with your leftover not-so-crispy sev. 3. You can make this Sev Paratha either with ratlami Sev, Bhujiya or any of your favorite sev. 4. I have used butter for roasting, but you can also use ghee or any vegetable oil.